Case management is an important component of structured and evidence-based primary care for chronically ill patients. Its effectiveness and efficiency has been evaluated in numerous clinical trials. This protocol describes aims and methods of a systematic review of research on the effectiveness and efficiency of case management in primary care. According to this protocol Medline, Embase, CINAHL, PsychInfo, the Cochrane Central Register of Controlled trials, DARE, NHS EED, Science Citation Index, The Royal College of Nursing Database, Dissertation Abstracts, registers of clinical trials and the reference lists of retrieved articles will be searched to identify reports on randomized and non-randomized controlled trials of case management interventions in a primary care setting without limitations on language or publication date. We will further ask experts in the field to avoid missing relevant evidence. Study inclusion and data extraction will be performed independently by two reviewers. After assessing risk of bias according to predefined standards, included studies will be described qualitatively. Subgroup analyses are planned for different chronic diseases and intervention strategies. If appropriate, a quantitative synthesis of data will be performed to provide conclusive evidence about the effectiveness and efficiency of primary care based case management in chronic care. Centre for Reviews and Dissemination (University of York): CRD32009100316. The concept of case management is thought to be an effective and efficient approach to manage patients with chronic illness and complex health care needs . Case management can implement key elements of the chronic care model, such as improved continuity of care by redesigning the delivery system and enhancing patients' self-management skills . It can also contribute to better implementation of evidence-based recommendations for diagnostic procedures, pharmaceutical treatment, life style counselling and monitoring of patients. Case management has been implemented in a range of clinical settings  but most chronically ill patients receive most of their medical care in primary care settings, at least in countries with a strong primary care system. Therefore this seems to be the most obvious setting for case management programs. A previous review on case management in primary care concluded that interventions supervised by generalists were not effective in reducing health resource use . Since then the body of evidence has vastly expanded so that an update of this reviews was required. Case management is rather a generic concept than a clearly defined intervention strategy . But conclusive answers about the effects of complex interventions like case management programs demand precise definitions for the inclusion of evidence . Therefore we aim to base the selection of studies on a basic principle of case management which can be found in various concepts [7–9] (figure 1). The principle case management process emphasises on highly intensive individualized care contrasting case management to disease management programs . Case Management starts with identifying cases in need for intensified management. As a next common step needs assessment and individualized planning are implemented in different concepts. Monitoring and/or re-assessment of the various actions which could be planned to manage the cases are more or less explicit elements of various case management approaches. All components of this process can be undertaken in different settings. In the context of our interest on primary care based case management we defined the involvement of a primary care physician (either general internist, general practitioner, family physician) in planning the management of individual cases as being essential. The principle case management process. 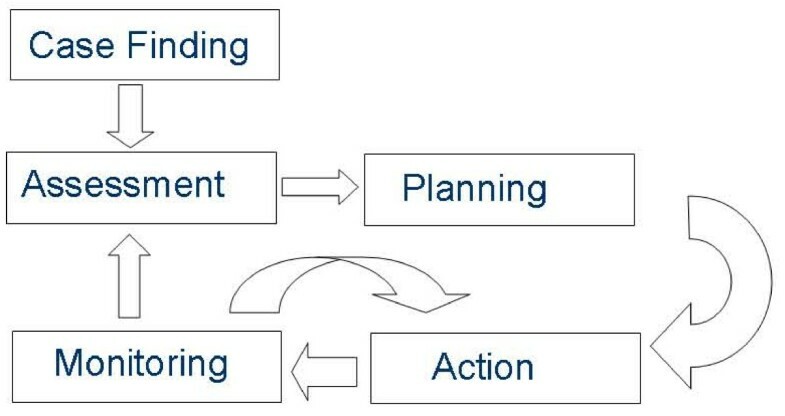 The figure shows the principle process of varying case management approaches. It consists of "case finding" and "individualized assessment" followed by "planning" different "actions" which are "monitored" and/or re-assessed with implications on future plans and actions. Using a typology to guide (sub)classification of interventions could further improve the quality of systematic reviews on complex interventions . The typology proposed by the Cochrane Consumer and Communication Review Group may be useful to classify different primary care based case management interventions from the perspective of the interacting "cases" and "managers" . This may help answering the question "why" some case management interventions in primary care work and others do not. We aim to review existing evidence on chronic diseases that can be effectively and efficiently cared for by implementing case management in primary care. We will further search for key components of case management which due to success or failure of these programs. This systematic review is performed according to standards derived from the PRISMA Statement . We include randomised and non-randomised controlled trials studying the effects and/or economic implications of case management interventions compared to routine care. No language, publication date or publication status restrictions will be made. Study protocols will also be included and we aim to contact authors to provide details about ongoing publications. Studies on adult participants (18 years and above) suffering from at least one chronic condition will be included in the review. Reports on interventions of palliative care, cancer screening, primary prevention, and treatment of drug or substance abuse are excluded from this review. Trials comparing case management interventions in which primary care physicians (alone or in collaboration with specialists) were involved in planning of the management strategy for individual cases will be included in this review. Case management is defined as consisting of all elements of the case management process as described above (figure 1). Monitoring in this context is defined as a periodic assessment (at least once in six months) which can result in a change of managing the case. We aim to contact authors in the case of ambiguities about key components due to lack of reporting in publications. We will include studies comparing case management interventions with routine management (usual care, attention control). The content of "usual care" will be carefully described in the review. We will search Medline via OVID (1950- 2009), the Cochrane Central Register of Controlled trials (2009), DARE, Embase (1980 to 2009), CINAHL (1982-2009), NHS EED, PsychInfo (1887- 2009), Science Citation Index (1987- 2009), Royal College of Nursing database, Dissertation abstracts (1861-2009) and Registers for clinical trials. The search is not limited to language or publication date. Searches will be designed and conducted by TF, AM and MW and assisted by librarians. Additionally we aim to search reviews relevant for the topic to retrieve further studies of interest. The reference lists of retrieved reports will be screened for potentially relevant studies. We will ask experts in the field for support to avoid missing relevant studies. We use a highly sensitive search filter for randomized controlled trials  and add "usual care" in the filter as this is a common term used for describing the control group of case management trials. We will identify studies of relevance using the MeSH terms: primary health care.exp and patient care planning.exp. A search in titles and abstracts will be performed using a combination of free text terms: case manage$.tw, care manage$.tw, disease manage$.tw, integrated care.tw, family medicine.tw, family practice.tw, general prac$.tw, primary care.tw. Eligibility assessment will be performed independently by two reviewers (TF, FK). Studies will be selected unblinded according to a standardized procedure. Abstracts with incongruent assessment results will be included in full text screening without further consensus discussion. Disagreements during the full text-based study selection process will be discussed and resolved by consensus. Two investigators will extract data from each study independently. We use a standardized protocol and reporting form to extract trial characteristics, patient data, outcomes and study quality. The data extraction instrument will be piloted with 5 study reports at minimum which will be included in this review. We aim to refine the instrument after the pilot test. Authors of published study protocols will be asked to provide information about first results and planned publications if results have not already been published. We will extract data from doubled reports of studies according to the following algorithm [1. review of study protocol, 2. review of the major publication i.e. published in a "high-impact" journal, report of major outcome, 3. review of all other publications with quantitative data, 3. contact to authors in the case of inconsistencies within reports]. All data of a single study will be displayed comprehensively in the review even if reported in different publications. We will design a data extraction form containing the following information: (1) characteristics of participants (age, gender, disease, disease stage and severity, method of diagnosis, drop-outs), and the trial's inclusion and exclusion criteria; (2) type of intervention (case finding, assessment, planning, intervention, monitoring, re-assessment; versus usual care or versus attention control); (3) type of outcome measure (including symptom level, quality of life score [using a validated tool], quality of care score [validated tool], adherence [validated tool], mortality, functional status, clinical parameters, surrogate parameters [e.g. HbA1c], admission rate, days of hospitalisation, outpatient care visits, emergency department visits, direct or indirect costs, length of follow-up, unintended effects of treatment). To assess the validity of included studies pairs of two reviewers will rate risk of bias according to predefined standards using the Cochrane Collaboration's tool for assessing risk of bias . This tool has been validated but a detailed checklist is needed to use it appropriately . Using the risk of bias tool adapted by the EPOC Group  we created a checklist which we would like to publish a priori as recently suggested  (see additional file 1: Risk of bias assessment checklist). As a first step, we will perform qualitative synthesis of included studies using summary of findings tables. Intervention strategies will carefully be described with emphasis on the interactions between case management teams and patients using a Cochrane typology . The content of usual care, intensity of case management interventions and training of case managers will further be used to compare included studies. Heterogeneity is a common problem of data synthesis from evaluations of complex interventions . We will perform subgroup analyses regarding the following domains: different chronic conditions, training of case managers and intensity of the intervention. Heterogeneity tests will be calculated within subgroups. We aim to synthesize data quantitatively if adequate to the findings. Any meta-analysis will be carried out using a random effects model. Single effect sizes (standardised mean differences) may be more appropriate to report quantitative synthesis in order to compare different outcome measures. If possible, sensitivity analyses are planned to simulate different levels of involvement of primary care physicians in planning. Sensitivity and subgroup analysis will also be undertaken for studies with largely different risk of bias. This review is a project within the research framework of the Competence Centre of General Practice Baden- Wuerttemberg which is funded by the Ministry of Science, Art and Research Baden-Wuerttemberg, Germany. TF leads the review and developed the study protocol. TF, FK, AM and MW contributed substantially to the design of the search strategy and abstraction of data. TF wrote the manuscript. AM, JS and MW critically revised it. All authors read and approved the final manuscript.